The HOLOEYE Spatial Light Modulator Pattern Generator software was developed for use with all HOLOEYE SLM models. The software allows the simple generation of diverse dynamic optical functions like gratings, lenses, axicons and apertures as well as the calculation of diffractive optical elements (DOE) from user defined images. To compute a DOE, the source image size needs to be smaller than 400×400 pixels. DOE computation for larger pictures is not supported by this software. Possible image formats are BMP, PNG, JPEG, GIF, XBM, XPM, MNG and the different PNM formats: PBM (P1 or P4), PGM (P2 or P5), and PPM (P3 or P6). The DOE is computed by using an iterative Fourier Transformation Algorithm (IFTA). 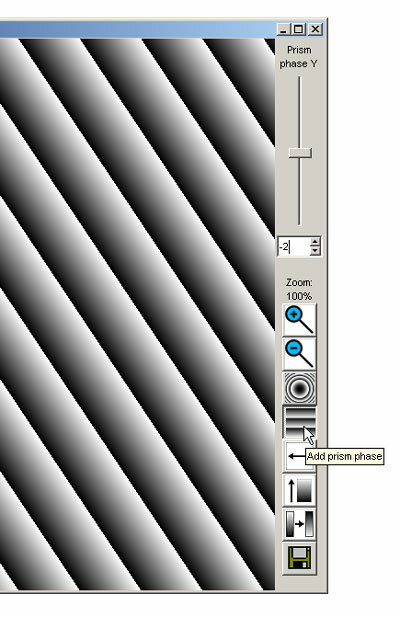 The image will be transformed to an image with 256 gray-scale values. In order to display all 256 gray-scale values a monitor setting of minimum 16 Mio. colors (24bit) is required. The calculated output DOE image can be addressed directly on the SLM out of the application software. The DOE image will be tiled to cover the whole SLM display area. 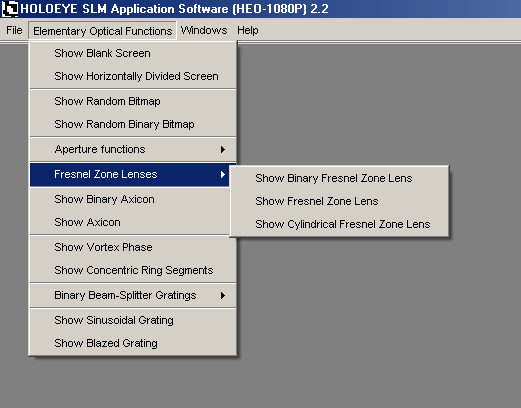 Additionally the DOE functions can be superimposed by lens functions or prism fuctions in X and Y direction. The focus / strength of these functions can easily be adjusted via a task bar using a slider or by entering a value directly. With this function you can create a homogeneous gray level screen. 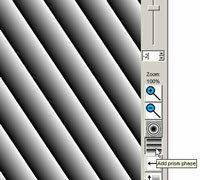 With this function you will create a horizontally divided screen, constitng of two homogeneous graylevel partial screens. With this function you will create a random pixel distribution using 256 grayscale values. This function can be used to realize the optical function of a random phase plate. With this function you will create a random pixel distribution using only two grayscale values. This function can be used to realize the optical function of a random binary phase plate. With this function you will create a Binary Axicon graylevel image representation. With this function you will create a 256-level Axicon graylevel image representation. Use this function to create a 256-graylevel image representation of a vortex phase. Use this function to create binary images consisting of concentric ring segments. With this function you will create a sinusoidal grating. With this function you will create a blazed grating.